Wading through the throngs Saturday at Spodek Arena for the League of Legends championship at IEM Katowice, sponsored by Gillette, it wasn’t hard to see which team thousands of Polish fans had come out to watch. The clear favorite was H2K, especially their countryman Jankos, H2K’s star jungler. Shouts of “H-2-What? H-2-K!” were roaring from the crowd even before their quarterfinal series against Hong Kong Esports (HKE) began. Such wild support brings both benefits and challenges, and the pressure was real as H2K prepared to face the formidable LMS team in an elimination match. In the first game, Jankos did not disappoint his fellow Poles, locking in crowd-favorite champion Lee Sin and roaring out of the gate with aggressive plays. 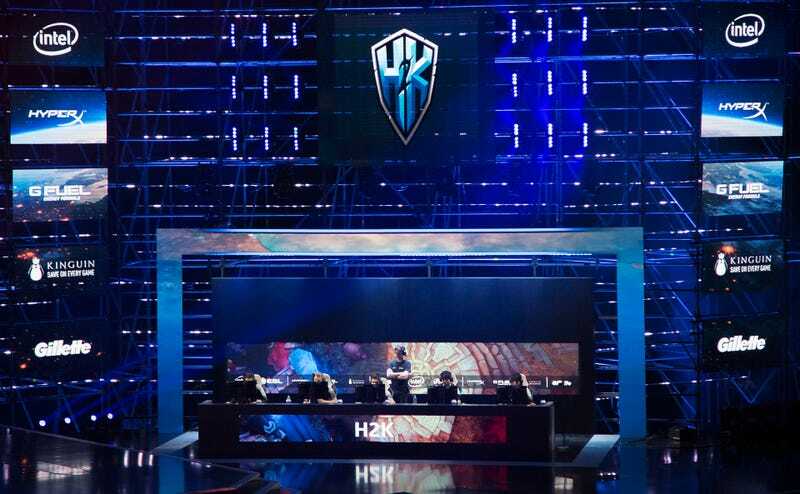 The game seemed firmly in H2K’s hands by the 20-minute mark, as the team held a four-tower advantage, as well as strong vision control. But a quick victory was not in the cards. A devastating Baron fight slowed their momentum — and, following several reversals, HKE defeated Jankos and H2K on their home turf. Following such a setback, many teams would have overcompensated by pursuing a cautious, loss-avoidance strategy. But H2K had other plans. “I think in game two everyone took a step back and stopped being excited, and just started to talk to each other more calmly,” said Odoamne, H2K’s top-laner. While the team may have been more settled, their gameplay was anything but. Jankos, playing Ivern, executed a flawless early gank in top lane for first blood, and from that point forward the hunt was on. It took H2K all of 28 minutes to dismantle the team that had just defeated them. The crowd was ecstatic. The overextension, occasional poor positioning, and lax communication that had cost them the first game were gone. This was the H2K fans had come to see: relentless, calculated and clean. He didn’t let up, either, deleting HKE’s support Nestea in a bottom-lane gank just a minute later. By the nine-minute mark, H2K held a strong lead. Odoamne and Jankos shared five kills (versus just one for HKE), and fluid bottom-lane play had allowed H2K’s ADC Nuclear to gain a strong CS advantage. But a wrench was about to be thrown in the works of the H2K machine. Technical pauses are not uncommon in competitive League play, but the one that arrived at 15:46 mark in game three would prove to be exceptional. In pro football, timeouts of just two minutes are regularly used to slow a team’s momentum, or freeze a kicker. This timeout would last longer than 18 minutes — 18 minutes in which H2K, and Jankos in particular, had to sit at their keyboards and contemplate the prospect of squandering their lead as they did in game one. League is a frenetic game, in which even small disruptions can cause many players to tilt or lose their rhythm. Sensing this, the Polish crowd made sure to prop up H2K’s spirits. An improvised lightshow began among the fans during the pause, and they began stamping their feat and chanting Jankos’ name in an ever-growing roar. The anticipation was mounting. Kha’Zix was fed. A spot in the semis was just within reach. Thousands waited for the pause to unlock. After the game resumed, it took Jankos only a few minutes to prove he had not lost his nerve. At 18 minutes he dared a perfect dragon steal, and H2K’s flawless disengagement afterwards showed that the team remained calm and collected. HKE would not get much of a chance to recover. Odoamne, refusing to be fully outshone by his jungler, racked up five unanswered kills in top lane, and by the 33-minute mark H2K had battered their way through HKE’s top inhibitor and onto the nexus in one brutal push. Asher Ross covers arts and culture for a variety of publications. He has also proudly mained Xin Zhao in Bronze for five seasons.